Life moves pretty fast.If you don’t stop and look around once in a while, you could miss it. Indeed, life has been moving too fast of late, with so many things happening at work and in our personal lives. Luckily, I work in a magical place, and it doesn’t take much time to find something of interest – a short walk across the garden for a meeting, a trip out to my car, or just doing some of the outdoor chores that need doing, there is so much to see, if you just pay attention. It also helps when my co-workers and volunteers find something and drop me a note or give me a call. That was what brought many of these snippets to my attention this past week. Here are some of the highlights from the week of what you can encounter in a native plant haven like the North Carolina Botanical Garden. 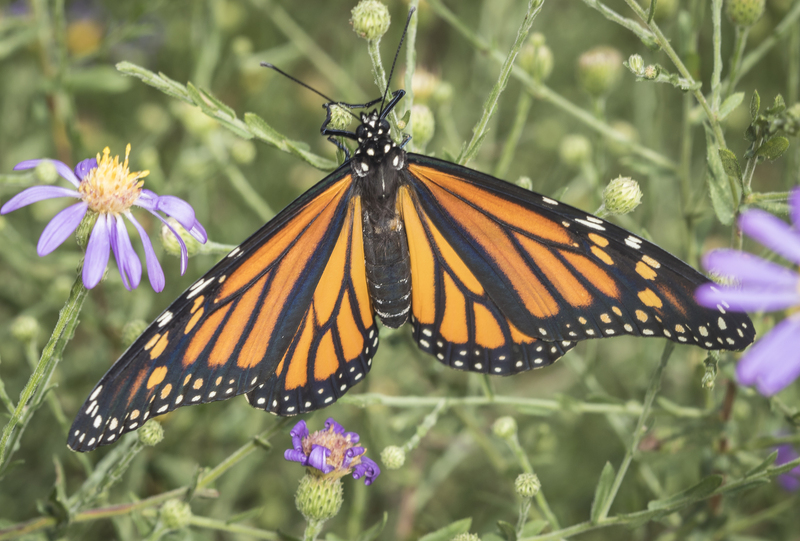 Some monarchs are not so lucky. This one was brought to me by a wonderful volunteer. She was hoping to release an adult butterfly, but a tachinid fly larvae emerged instead. 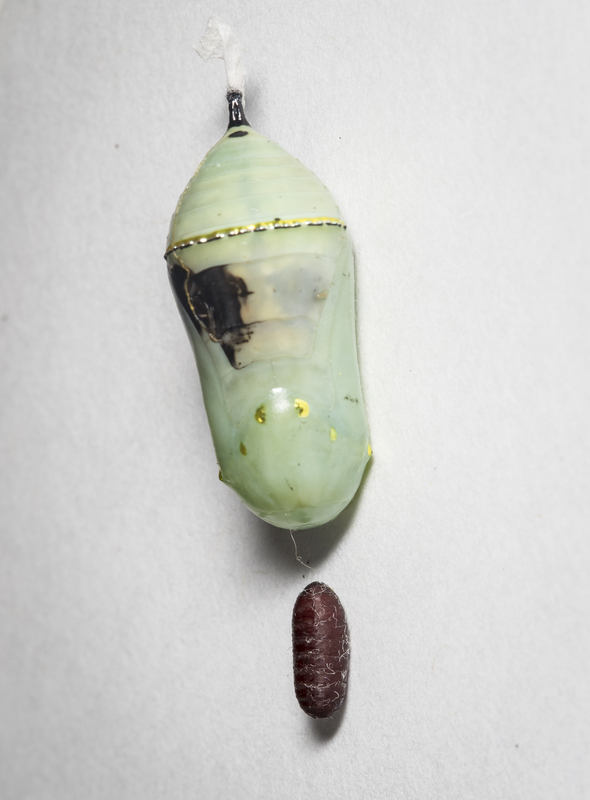 Its pupa is the brown case beneath the damaged monarch chrysalis. Tachinid flies are common parasitoids of many butterflies and moths. But I had never found a caterpillar with the white eggs of one of these flies on it until I stumbled across this one this week. 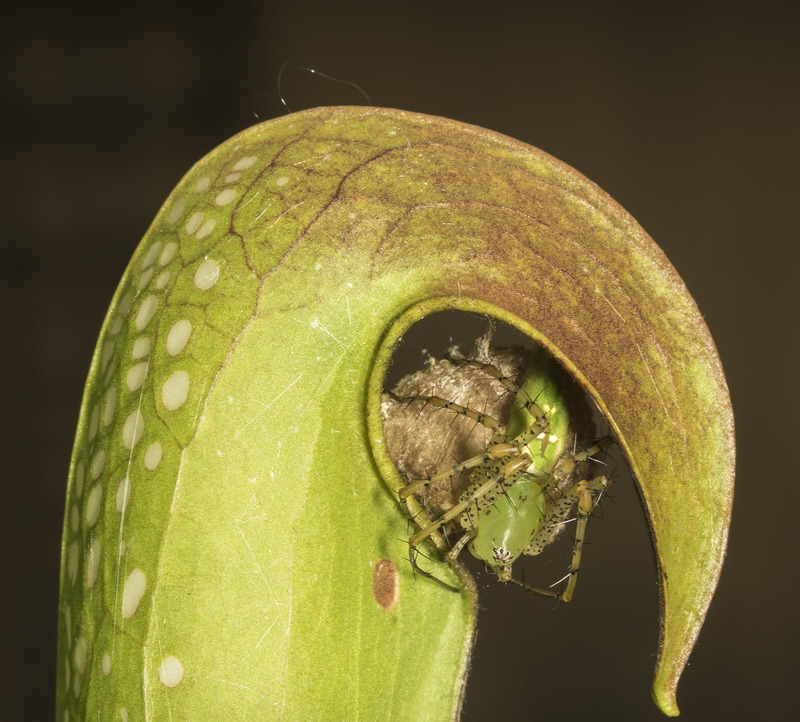 This female Green Lynx Spider laid her egg sac in the protected cover of a Hooded Pitcher Plant. Another Green Lynx female sits next to her recently hatched spiderlings atop a Cardinal Flower seed stalk. 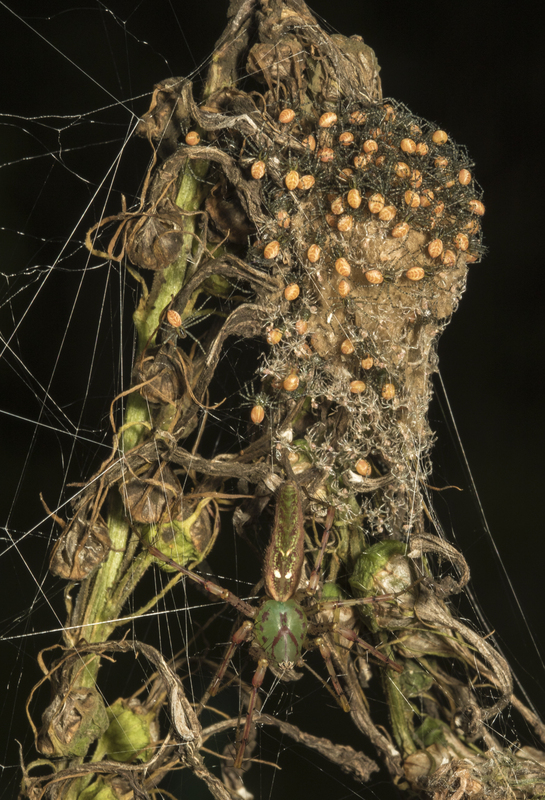 These Green Lynx Spider babies have molted once and will soon disperse away from their protective mother. 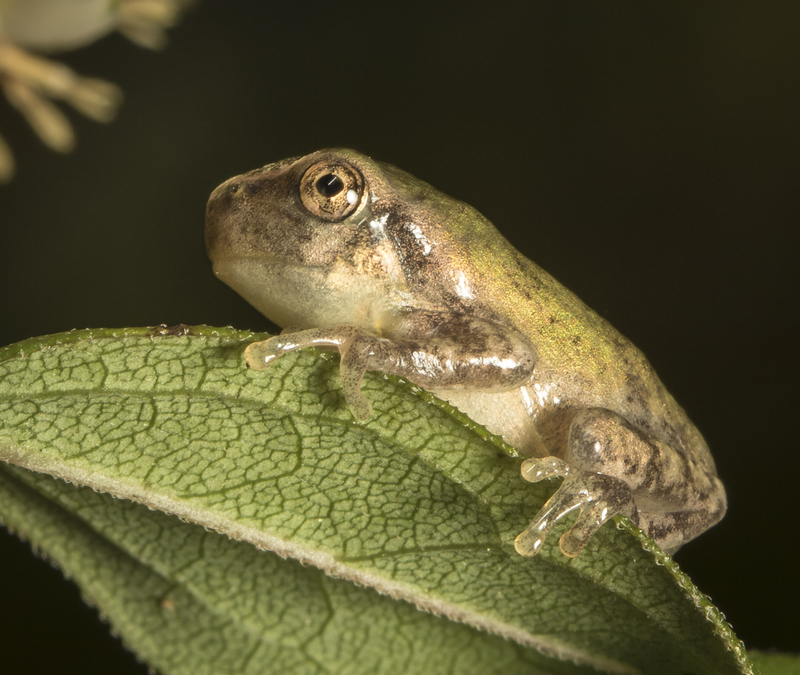 After our wet summer, the Garden is now alive with many tiny Cope’s Gray Treefrogs. 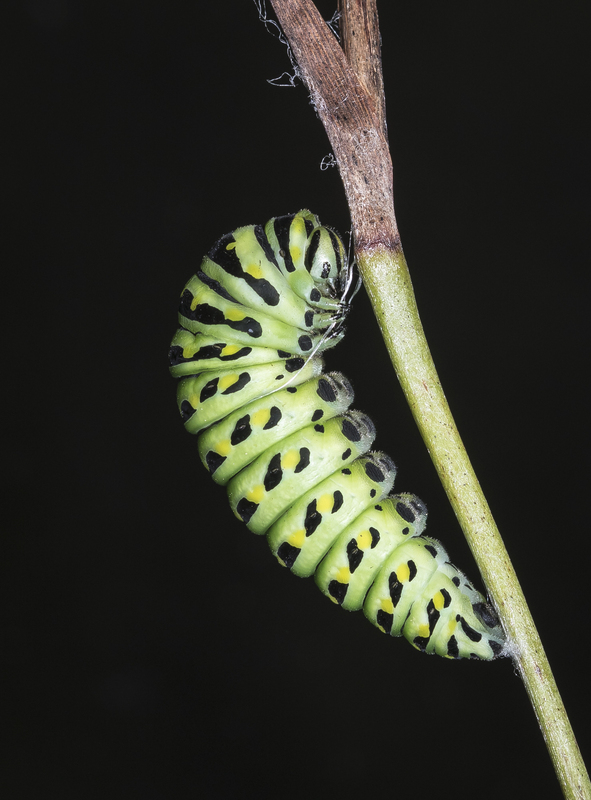 A co-worker alerted me to this Black Swallowtail pre-pupa one afternoon this week. 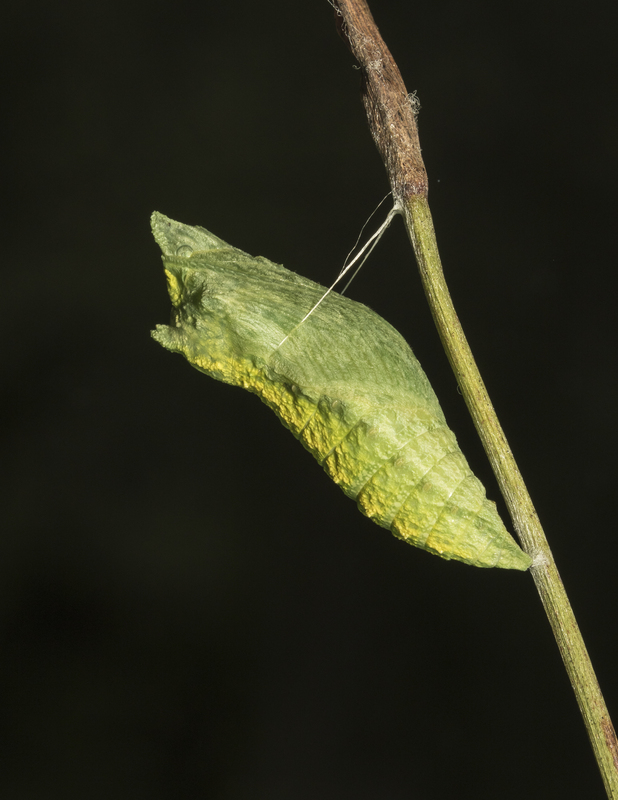 Knowing it would shed one more time and reveal the chrysalis in the next 24-hours, I brought it to our volunteer training the next morning. 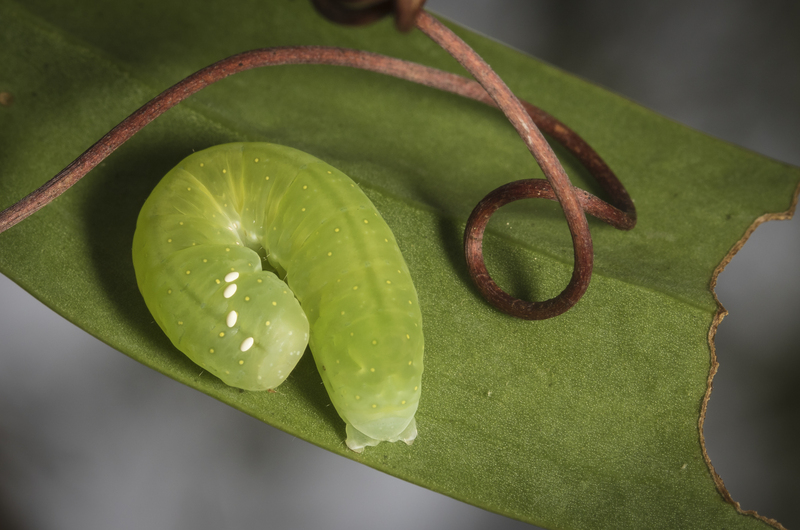 I carried the pre-pupa along on a training session and, right on schedule, the last molt occurred and everyone was able to witness the amazing transformation to the chrysalis. This entry was posted in Natural History and tagged NC Botanical Garden by roadsendnaturalist. Bookmark the permalink. As usual your photos are super cool! Thanks. Keep wishing for more time! I guess I sometimes forget my own advice. GADS! This is like the Sci-Fi Channel! Very nice! I like things such as this. I was the little Science nerd naturalist kid. I had the box in my room with a chrysalis waiting for a butterfly to emerge. Praying mantis nests. 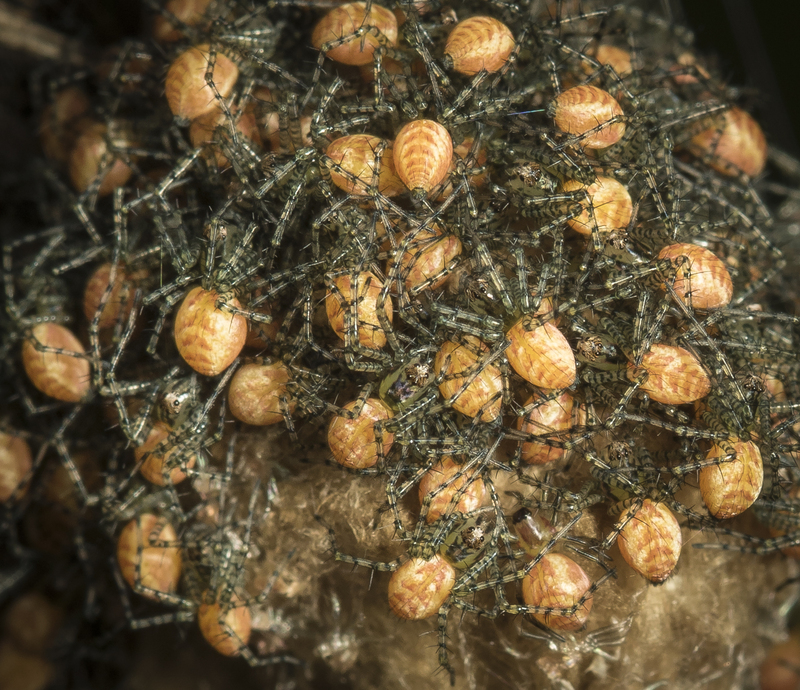 Spittle bug wands. Spider egg sacs now and then until mom would find them and make me put them back outdoors. Thanks for sharing your insights. Too many folks don’t pay attention to Nature’s wonders. I so enjoy the connection with what is happening in nature (and your incredible photos! )– especially where I am not! I thought you might also enjoy this post on a blog in my “neck of the woods” on an island in Salish Sea (Puget Sound) Washington – Whidbey Is. we call “the closest place to far away”! Somehow it is comforting to know we have mink here – as well as one lone elk!! I totally agree about the wonder all around us if we just take time to notice! Awesome blog post. Mink are a rarity to see in most places. She got great photos too. Thanks for sharing.